(Photo credit: Lucas Noonan/Premier Boxing Champions) CORPUS CHRISTI, TEXAS (Sept. 6, 2015) – Anthony “The Dog” Dirrell (28-1-1, 22 KOs) scored an impressive unanimous decision over Marco Antonio “El Veneno” Rubio (59-8-1, 51 KOs) Sunday afternoon in the Premier Boxing Champions (PBC) on CBS main event from the American Bank Center in Corpus Christi, Texas. Dirrell proved to be too fast for Rubio as he consistently beat the Mexican veteran to the punch and was able to control the fight. Rubio hung tough throughout the fight, continuing to come forward in his attempts to catch Dirrell. Dirrell won by scores of 100-90 on all three judges scorecards and showed that he still had more left in the tank when he pulled off a backflip in the ring just seconds after the final bell. 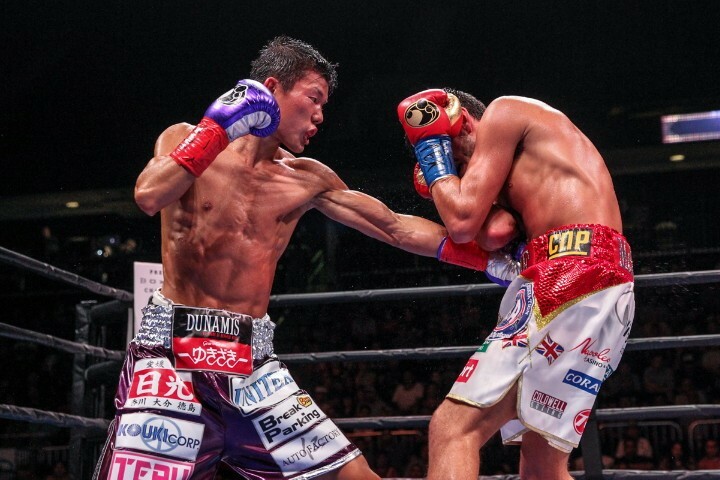 In the co-main event, Jamie McDonnell (27-2, 12 KOs) used immense pressure to defeat Tomoki “El Mexicanito” Kameda (31-2, 19 KOs) by unanimous decision and retain his bantamweight world title. McDonnell and Kameda went back and forth throughout the 12-round affair that saw McDonnell apply pressure with his consistent jabs while Kameda looked to score with big counters. McDonnell was able to score a knockdown in the final round with a sharp left hook that sent Kameda to the canvas. Kameda and his corner argued that the knockdown should have been ruled a slip, but to no avail. The judges’ scores were 116-11, 115-112 and 117-110. “I had an off night when I fought Badou Jack, but everyone saw my jabs and straight punches. I was moving and I was really catching him. “Rubio is a tough fighter but I was able to control the fight with my speed and skills. I felt really good in there. “He was a very fast fighter. I tried to push and push but I could not find him. “I love boxing. I will get back in the gym and train for another fight because this is what I love to do. “I didn’t think it was a controversial decision, because I always felt in control and I believe that I won the fight comfortably. “My jab was the key in the fight and it was a great weapon for me. I just had to make sure that I stuck to the game plan we had been working on for over eight weeks. “When I dropped him in the last round, I think he did slip a little bit, I tried to stay away. But I did catch him. After that I know I sealed the victory. “I thought I won this fight a lot more clearly than the last fight. PBC on CBS was promoted by Leijah Battah Promotions and Warriors Boxing.